About a week ago, I was grocery shopping and saw a flat of mangoes for $3. It was too good to turn down, but then I had a flat of swiftly-ripening mangoes kicking around my kitchen. So I took a look online at a bunch of recipes for canning mango chutney, combined a few, modified them to suit my own tastes, and came up with a mango chutney I’m pretty happy with. It’s a dead-simple recipe that would be a good one for first-timers, as it’s not too fussy and doesn’t take a lot o. 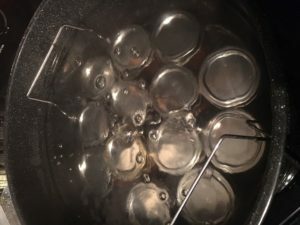 Just remember to wash everything in hot, soapy water, and let everything air-dry – that’s really the key to safe canning. If you don’t want to can it, this chutney will keep in the fridge for about 5 days, but the volume is such that it’s worthwhile to can it. Delicious on Latkes, samosas, or any fried foods! Update September 28, 2017: I’ve just realized that I’ve been making this recipe for 8 years, and that the format could use an update to match the way I write canning recipes now. Time: 45 minutes to peel and chop the mangoes, depending on how fast you work; 40 minutes for cooking the chutney, 20 minutes to process the jars. When to eat: Anytime after making it, but the flavours will deepen a bit over time. Generally its considered safe to eat for up to 2 years, but if you store it in a dark, cool place, it could last longer. I don’t find that I have any chutney left after a year, as I give it away at Ecksmas and my sister really likes it, too. Most of the items listed below are standard canning equipment that you will be able to use over and over. Wash your 250mL jars, new lids, funnel, ladle, and any other tools in hot, soapy water. Wash, peel and chop ripe mangos. In a large pot, combine olive oil, cinnamon stick, red pepper flakes, peppercorns, coriander seeds, mustard seeds, and fenugreek seeds. Fry at medium heat until fragrant, about 5 minutes. Stir frequently. Add onion, ginger root, salt, sugar, and paprika. Fry for 5 minutes, stirring constantly. Add mangoes, vinegar, and lemon juice. Reduce heat, stir to combine, cook for 35 minutes or until thickened to taste (chutney will continue to thicken as it cools). Using a ladle, fill jars with hot chutney mixture, leaving a ½ inch headspace at the top. Using a rubber spatula or similar, remove air bubbles by running it around the edges of the jar as needed, occasionally pressing in against the fruit to remove air bubbles that you can’t see. Wipe the rims of the jar with a clean cloth, and add lid and screw band. Finger-tighten screw band; do not over-tighten. Place in boiling water bath, ensuring at least 1 inch of water above the tops of the lids. Process the jars of chutney in a boiling water bath for 15 minutes (if you’re using a different size of jar, or live more than 1000 feet above sea level, water bath times are different! Look them up online before starting). Remove jars from water bath carefully, without bumping or jostling. Allow to cool undisturbed overnight. Test the lids of the jars to see if they’ve sealed properly – a proper seal means the lids are bowed down in a bit in the centre and don’t move when pressed. If the lids pop up and down when you press them, they haven’t sealed properly and can’t be stored at room temperature. It’s possible to reprocess the jars with a brand-new lid to see if they will seal properly, but otherwise they should be stored in the fridge and eaten early. Store jars in a cool, dark place until you’re ready to use them. Check occasionally to ensure that the screw bands aren’t rusting – this can cause the seal to break. ** Re: Coriander seeds – these are my favourite, and I tend to add extra, because when you bite into a coriander seed in a mango chutney it’s like heaven exploded in your mouth.